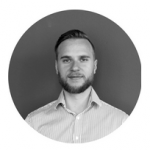 Guest post by Algirdas Desceras, online marketer at Syndy, an online platform for product content exchange between retailers and suppliers. With new online grocery (e-grocery) ventures popping up around the globe and traditional retail chains making huge investments into developing their online presences, e-commerce is expected to play an increasingly important role in grocery retail. 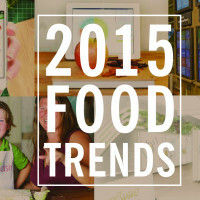 The global online grocery market is growing fast and is expected to reach €80B by 2018. In our latest report, The State of Online Grocery Retail in Europe 2015, Syndy explores e-grocery growth and trends, as well as future market developments. Syndy researched the four most advanced European markets, as well as the US, to find out the acceleration rate of the e-grocery sector. 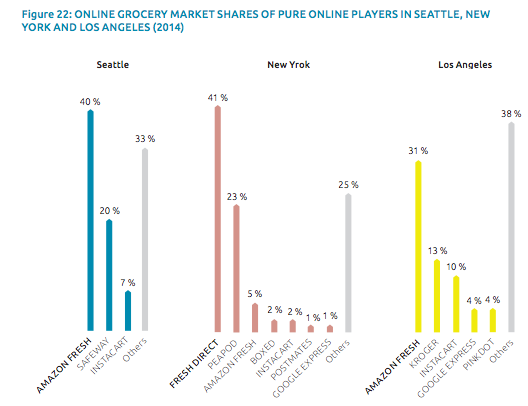 All of the researched markets showed remarkable double-digit growth of online grocery sales, making it the fastest growing channel in grocery retail across 2014. The Dutch market grew the most at 55 percent, while the French market grew the slowest, still reaching an impressive 25 percent growth nonetheless. The German, U.S. and British markets grew by 38 percent, 27 percent and 26 percent respectively. 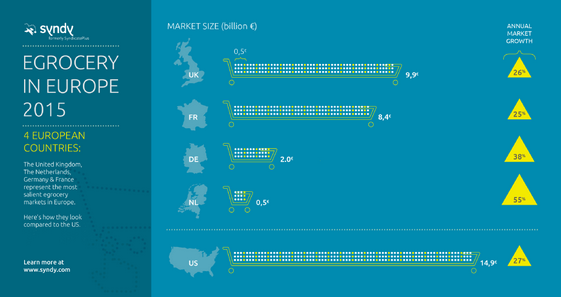 Our research also revealed that the U.S. has the largest overall e-grocery market (€14.9 billion), whereas e-grocery in the UK has the largest share, 4.4 percent of the grocery retail market. According to our research, competition between online grocery retailers increased throughout the last year. New players entered the arena, and established players pushed innovation and operational excellence to craft attractive online offerings. Some of the big traditional retailers looked for new ways to bypass costly IT and operational developments. They did so by outsourcing key technological and business capabilities to third parties. For example, British retail giant Morrisons partnered with pure player Ocado to benefit from their 15 years of e-commerce and logistics experience. The partnership was also hugely beneficial to Ocado because it created an additional stream of revenue which lead to their first profitable year. 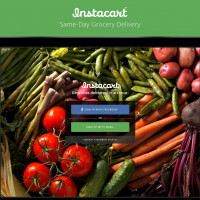 In the US, Whole Foods teamed up with grocery delivery startup Instacart to gain from their mobile expertise without developing its own delivery capacities. 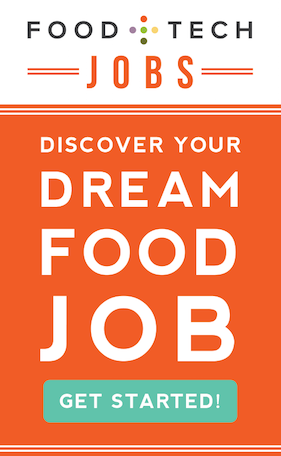 Following a successful pilot scheme, the Whole Foods Instacart partnership is now being expanded across the US. 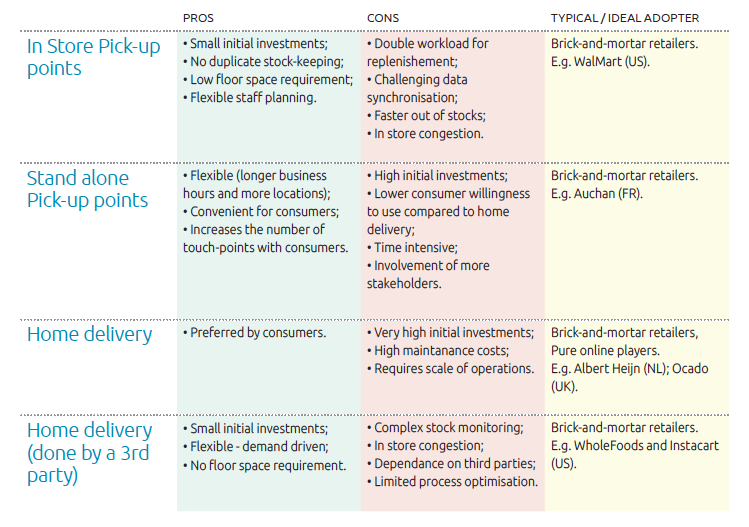 Across 2014, most traditional retailers chose the pick-up point delivery model (a model where consumers collect pre-ordered products at designated pick-up locations) for their online roll-outs. At the same time, established players grew their pick-up point networks to expand their online service reach to less populated areas. For brick-and-mortar retailers, the pick-up point model makes most economic sense, yet consumers strongly prefer home delivery (80 percent) since the “convenience factor” is the key driver of online grocery shopping. Retailers are therefore searching for new ways to offer home delivery at minimal costs, or even for free. Membership schemes, like Amazon Prime, give consumers access to unlimited home delivery at a fixed monthly fee. These plans are growing in popularity and seem to offer retailers a way of satisfying consumers and generating a profit for the business. While online retailers are pushing the bounds of operations, logistics and merchandising in e-grocery, CPG companies face the challenge of effectively marketing their products in this new channel. By interviewing CPG and Retail experts, Syndy found that manufacturers will need a thorough understanding of online shopper needs, which are not always correctly addressed at the moment. 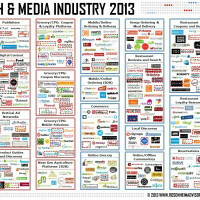 Moreover, it seems that online and offline consumer journeys often mix and merge. Therefore, it is important for CPG companies to deploy integrated online, in-store and traditional marketing tactics to get the best results, i.e. an omnichannel approach to marketing CPG products. Another challenge that CPG companies face is controlling product content online. While a number of retailers have been selling CPG products online for years, the exchange of rich digital product content between suppliers and retailers is not effective. As a result, online retailers display incorrect product content to the consumers, harming supplier’s brand value as a consequence. CPG companies need to take more initiative in tackling this problem. What Does the Future Hold for Online Grocery? Syndy believes that e-grocery will continue to flourish across Europe and the US for multiple reasons. While the global online grocery market showed remarkable growth over 2014, it is lagging behind other product categories such as electronics and books. While we do not expect groceries to be as popular online as the aforementioned product categories, there is still plenty of space for e-grocery growth. Additionally, pure players have been testing and pivoting their business models and many seem to have crafted strong business propositions. Companies such as AmazonFresh (US), Instacart (US) and Ocado (UK) have gained instrumental know-how and put well-polished processes in place. Expansion, not only in their home markets but also internationally, is very likely. Regarding the growing competition from discounters: traditional retailers such as Walmart and Tesco will keep investing into their omnichannel initiatives. Consumers seeking value for money and convenience will increasingly adopt this way of shopping and drive growth of the online channel. Finally, with venture capital firms pouring millions into food tech business, more digital ventures and innovations, like Internet of Things appliances, will emerge that will encourage more and more customers to make online grocery shopping an integral part of their lives. To learn more about the state of online grocery retail in Europe and the US, you can download our full report here. Algirdas Desceras is one of the authors of The State of Online Grocery Retail in Europe 2015. He has a Master’s degree in Business Administration and currently works as an online marketer at Syndy. Algirdas is passionate about CPG products and their future in the online channel.